Pinched this coat off my sister which I think is actually a hand me down off my cousin. Im unsure of the brand as it doesn't actually have a label in it to say where its from! Its a bit creased as I've been bunched up at my desk in it all day working! Its just too cold at the moment, knowing that it will only get worse makes me sad Although I'm so much more of a winter person than a summer one! Nothing I like more than coats and layers! Cant wait to bring all my scarves and hats down from the attic! This is absolutely gorgeous! I love all your clothes!!! I have the same dress, love the way you styled it. Especially with the scarf! This is very chic! I love the coat. The best thing about Autumn/Winter is the clothes! I think I actually prefer my winter wardrobe to my summer one. gorgeous outfit! you look as annoying beautiful as ever..! Your collection of rings are lovely! Great scarf too. Yeah It's freezing at the moment, plus the wind just makes it worse! oh! I totally love this style! and the scarf is way cool. I love its simplicity yet, stylishness. really resembles my outfit post... less is more! Your leopard scarf is so much fun! And adore your nail lacquer! The pictures turned out well I see?! Looking a beaut as always! And agree with you, I'm totally a Winter person.. But it's funny, after living in the French Alps for 4 years where I managed to deal with the snow.. I somehow STRUGGLE with the cold here?! Is your scarf recent? I love it! You look awesome. Can't believe that scarf is Primark. It looks so nice! i love the dress! looks uber comfy! and you always have the best nails and rings! The rings are so pretty! I love layers and coats and scarves so I am going to embrace the cold weather this year, I say that now but might be a different story when I can't feel my toes. 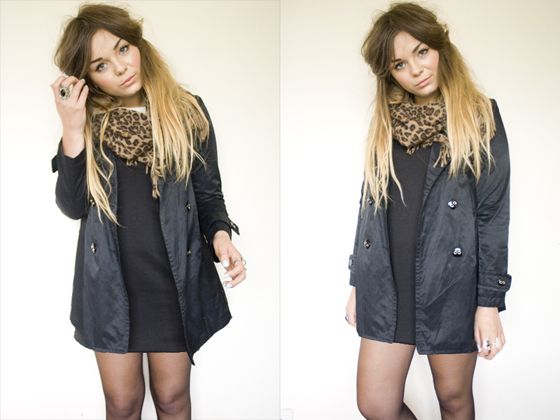 Lovely outfit, I like a black/leopard print combo, classic but a bit on the edgy side?! Your nails look amazing! I love the colour of the ends of your hair, that blonde is amazing. I cannot wait for winter and snuggling up in scarves and hats and gloves! I love your scarf, the leopard print is lovely. Your coat is wonderful too, it looks similar to one I got in New Look a few years ago, but I don't think it's the exact same one. I love that colour. Where abouts can you purchase this colour? Wonderful outfit! I love layering as well. It's hard to do in the summer! Layers are great! 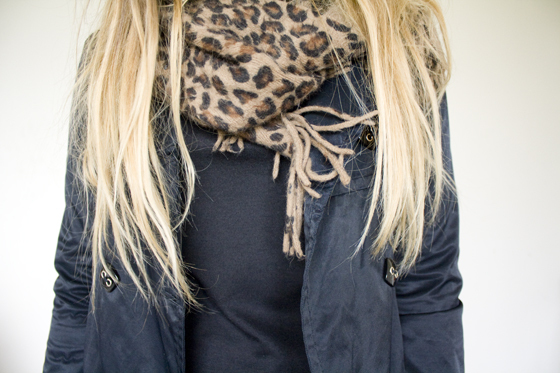 Love the leopard scarf with black, looks great! Your nails are lovely if they are real ! A question (in case you have answered something similar I apologize but I cannot remember), do you use fresh nails each time you change your nail polish or do you also de-polish nails and re-use them? I am now considering those stick-on nails as my nails are horrible, weak and tend to split even before they have properly grown out of the finger... I am so sick and tired of it.